Three aspects of solar radiation are biologically significant. The first is the intensity of radiation, the amount of radiant energy falling on a unit of surface area in a unit of time. The second is the spectral distribution of radiation that governs the photochemical process of photosynthesis. The third aspect is the radiation distribution in time, which is important for photo-periodic phenomenon. Quantification of intensity and spectral distribution of radiation within crop canopies is important because of its control of the photosynthetic process and the microclimate of the plant community. The rate of photosynthesis is dependent on the availability of photosynthetically active radiation intercepted by the leaves. The rate of transpiration taking place from the plant canopy is also controlled to a great extent by the radiation energy. Thus, knowledge of radiation transmission through the elements of a plant com munity is necessary to know the quality and quantity of incident radiation used by the plants. The capture of radiation and its use in dry matter production depends on the fraction of the incident photosynthetically active radiation (PAR) that is intercepted and the efficiency with which it is used for dry matter production. Intercepted radiation (Si) is often estimated as the difference between the quantity of incident radiation (S) and that transmitted through the canopy to the soil (St). However, this approach has inherent technical and theoretical difficulties since is does not account for the reflection of incident radiation from the canopy surface (typically 5 to 20 percent depending on surface characteristics and moisture content), or for radiation intercepted by nonphotosynthetic canopy elements. As a result, interception by photosyn-thetically competent tissues may be greatly overestimated, particularly for canopies which are senescing or which contain numerous woody structural elements. The quantity of radiation intercepted depends on the amount received by the canopy, canopy size, duration, and fractional interception (f). The seasonal time course of f, defined as Si/St, varies greatly depending on canopy architecture and the phenology of the vegetation involved. As such, f increases more rapidly in cereals such as sorghum than in legumes such as groundnut. Furthermore, mean f values calculated over the duration of the crop are generally lower in short-duration cereals and legumes than in perennial species, largely because of the differing duration of ground cover (Squire, 1990). The distribution of radiation in a plant canopy is determined by several factors, such as the transmissibility of the leaf, leaf arrangement and inclination, plant density, plant height, and the angle of the sun (Vorasoot, Tienroj, and Apinakapong, 1996; Cohen et al., 1999; Courbaud, Coligny, and Cordonnier, 2003). Leaves of deciduous trees, herbs, and grasses (including cereals) have transmissibility ranging from 5 to 10 percent. The broad leaves of evergreen plants have a value of 2 to 8 percent. Transmissibility varies slightly with the age of the leaf. The transmissibility of a young leaf is relatively high. With the maturing of the leaf, it declines but then rises again as the leaf turns yellow. The transmissibility of a leaf is directly related to its chlorophyll content. The logarithm of transmissibility decreases linearly with an increase in the chlorophyll content. If the leaves that transmit 10 percent of the radiation were horizontally displayed in continuous layers, only 1 percent of light, mostly in the green region, could penetrate the second layer. However, leaves are rarely displayed horizontally. The relative light interception of horizontal and erect foliage is calculated in the ratio 1 to 0.44. Therefore, the actual light gradient within the canopy is not as steep as the transmissibility will suggest. On average, when the total leaf area equals the area at the ground, the mean transmissibility is around 75 percent for the more upright leaves and 50 percent for the more horizontal leaves. In weak light, any departure of the leaves from the horizontal position reduces the net photosynthesis. In full sunlight, the optimum leaf inclination for efficient light use is 81° (Figure 2.6). At full sunlight, a leaf placed at the optimum inclination is 4.5 times as efficient in using light as a horizontal leaf (Figure 2.7). For more efficient use of light, the upper leaves in a plant canopy should have a near-vertical orientation, whereas the lower foliage should be almost horizontal. An ideal arrangement of the plant canopy is for the lower 13 percent of the leaves to be oriented at an angle of 0 to 30°, the middle 37 percent of the leaves should be at 30 to 60°, and the upper 50 percent leaves should be at 60 to 90° with the horizontal (Chang, 1968). 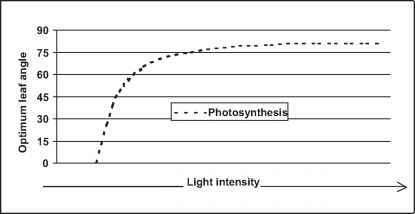 In the case of young plants, the percentage of light interception is not only small but also variable with the time of day. It is at a minimum at noon and at maximum during the morning and evening hours. When the plant height increases, the interception of light by the canopy also increases, with only a small variation at different times of the day. where I is the intensity of light at a particular height within the canopy, Ia is the intensity at the top, k is the extinction coefficient of the leaf, f is the leaf-area index (LAI), and e is the base of natural log. 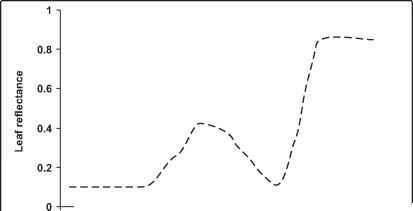 The extinction coefficient can be defined as the ratio between the light loss through the leaf to the light at the top of the leaf. The extinction coefficient varies with the orientation of the leaf. Its value is low in stands with upright leaves and high in stands with more or less horizontal leaves. 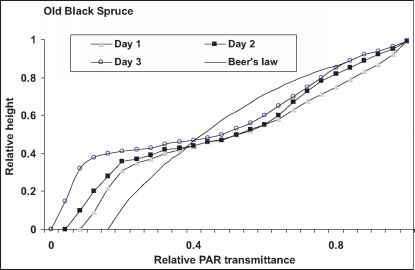 Roujean (1999) made actual measurements of solar radiation profiles in black spruce canopies on typical summer days and compared those with Beer's law values (Figure 2.8). He observed certain deviations from the Beer's law extinction and assigned those to seasonal effects, such as the angle of the sun's rays. As solar radiation penetrates the canopy, its quality undergoes transformation in different layers (Baumgartner, 1973). After every reflection and transmission, red and infrared radiation increases relative to the other wavelengths. In the interior of the canopy there is a relatively greater decrease of light in the chlorophyll absorption bands at 0.45 nm and 0.65 |„im, and a relatively small decrease in green at 0.55 ^m and infrared at 0.80 ^m. In less tall crops such as alfalfa, about 30 percent of the total radiation and 20 percent of light reaches the ground. For a tall maize crop, the transmission of infrared radiation to the ground is 30 to 40 percent. In the visible part of the spectrum, the transmission is only 5 to 10 percent. Flint and Caldwell (1998) measured global (total) and diffuse solar radiation in canopy gaps of a semideciduous tropical forest in Panama. Compared to unobstructed measurements taken outside the forest, the sunlit portions of gaps were depleted in the proportion of UV-B relative to PAR, especially at midday. Shaded areas, in contrast, were always richer in UV-B relative to PAR, but the magnitude of the change varied greatly. 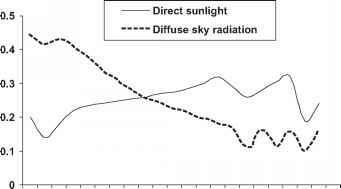 It was suggested that this variation was due to the differences in the directional nature of diffuse solar UV-B radiation as compared to diffuse PAR. Measurements in the gaps showed substantial reductions in the proportion of radiation in the diffuse components of both the UV-B and PAR wavebands. 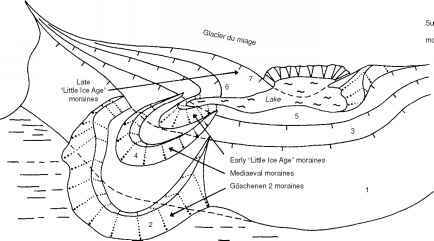 However, because of the greater proportion of UV-B that is diffuse, it tended to predominate in shaded areas. Similar patterns were seen in measurements taken at temperate latitudes. The composition of solar radiation changes with the angle of the sun. The maximum visible spectrum penetration is at noon. Penetration of infrared radiation is comparatively high soon after sunrise and just before sunset. The early morning and evening values are higher because of the greater amount of diffused light. Anisimov and Fukshansky (1997) measured the spectral composition of incident solar and diffuse sky PAR as well as the spectral scattering coefficient of PAR for a green leaf. The results are shown in Figures 2.9 and 2.10. The visible region (approximately 0.385 to 0.695 ^m) of the solar spectrum is generally referred to as photosynthetically active radiation. Although the global radiation is expressed in terms of W m-2, the unit of PAR measurement is ^E m-2 s-1 . Photosynthetic photon flux density (PPFD) is the number of photons in the photosynthetically active band of solar radiation. It is usually defined in moles of photons per unit surface and per unit time (mol m-2 s-1). 1 ^mol photons m-2 s-1 = 6.022 x 1017 photons m-2 s-1 = 1 ^E m-2 s-1. For conversion sake, 2.02 ^mol photons m-2 s-1 of PAR is treated as equivalent to 1 W m-2 of global radiation (Berbigier and Hassika, 1998; Alados et al., 2002). PAR is often calculated as a constant ratio of the broadband solar irradiance. Many reports are available in the literature to estimate PAR from the more routinely measured parameters of solar radiation, light intensity, and cloud amount. Several of these reports indicate the desirability of local calibration for the relationship between PAR and solar irradiance to account for local climatic and geographic differences such as cloudiness, day length, and diurnal pattern of solar radiation. A wide range of values has been quoted for the ratio (fe) of PAR (W m-2) to global solar radiation (W m-2). Several researchers suggest that this variation can be ascribed to differences in the waveband limits chosen to define PAR and in part to the different methods used to measure or calculate fe (Olesen, 2000). On the other hand, many people argue that different lower and upper waveband limits have no significant influence on the ratio received at the earth's surface. At higher and middle latitudes, the daily average value of fe is little affected by atmospheric and sky conditions. Systematic differences from day to day are largely a function of cloudiness. Even in the tropics, fe should be a conservative quantity on clear days. For a clear day, fe = 0.51, and for very cloudy skies, fe = 0.63 have been measured in tropical countries. Udo and Aro (1999) made measurements of global solar radiation (Rs) and global photosynthetically active radiation for a period of 12 months at Ilorin, Nigeria, to find the relationship between them. The results of the measurements showed that the average ratio of PAR to Rs for the year was 2.08 E MJ-1, with the dry and rainy season values of 2.02 and 2.12 E MJ-1, respectively. The minimum monthly mean daily ratio of 1.92 E MJ-1 was in January, representing a typical dry season month, while the maximum was 2.15 E MJ-1 in May, representing a rainy season month. The ratio values in the rainy season months and even dry season months remain constant at about 2.1 E MJ-1. On a daily basis, the maximum and minimum ratios were 1.86 and 2.31 E MJ1, respectively. Hourly values of the ratio increased as the sky conditions changed from "clear" to "cloudy." Hassika and Berbigier (1998) made continuous measurements of global and diffuse PAR throughout the year, within and above a forest. On clear sky days, roughly 65 percent of the incident PAR was absorbed by the needles, stems, and branches, 20 percent was reflected, and the understory absorbed the remaining 15 percent (Figure 2.11). PAR interception in actively growing wheat crops was studied by Prasad and Sastry (1994). Two wheat varieties were grown with irrigation during the 1985-1986 winter season and assessed for total solar radiation interception, PAR, net radiation, and albedo. Maximum solar radiation and PAR interception was at 100 days after sowing (milk ripeness stage). For high values of crop net photosynthesis, the number of rows is more important at high light than at low light, whereas crop height is more important at low light than at high light (Thornley, Hand, and Wilson, 1992). The distribution of leaf angles (more vertical than horizontal angles) is important for maximizing whole-plant photosynthesis (Herbert, 1991).